Disclosure: This is a sponsored post, but as always all opinions are 100% my own. Two things are for sure: 1) I love chocolate; 2) I love peanut butter. Okay, make that three sure things…because I love cheesecake, too! 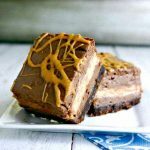 So it goes without saying that I couldn’t resist sharing this Chocolate Peanut Butter Cheesecake Squares recipe for the #Chocotoberfest by Imperial Sugar blogger project. I’m joining an awesome group of chocolate-loving bloggers this week to share our favorite chocolate recipes and to give readers an opportunity to win a chocolate prize pack worth $350! What’s not to love about that?! My Chocolate Peanut Butter Cheesecake Squares start with a chocolate crumb crust. Lining the pan with aluminum foil makes for easy removal and cutting into squares once the dessert is baked and completely cooled. Divide the basic cheesecake batter and stir in melted chocolate chips and peanut butter chips to make the different flavor layers. Start with a layer of chocolate batter. 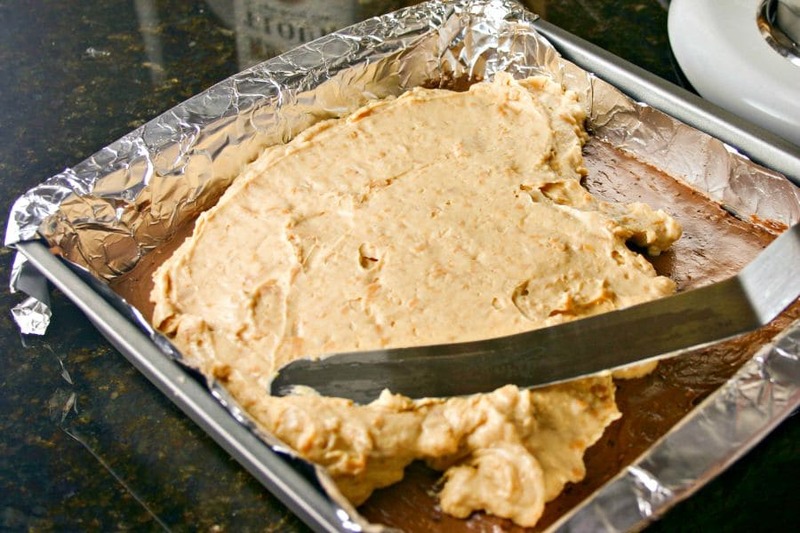 On top of this, add the layer of peanut butter batter and smooth carefully to the edges. Add last, another layer of chocolate cheesecake batter. Are you drooling yet? Because I am! This cheesecake is smooth and creamy and very rich. I love the layer of peanut butter sandwiched in the middle of this dreamy chocolate, but if you prefer to go all in with the chocolate flavor, just add another cup of chocolate chips and leave out the peanut butter chips. Either way, this is a luscious cheesecake that can be served up for a casual party (I baked a batch to share with friends at a recent football party). 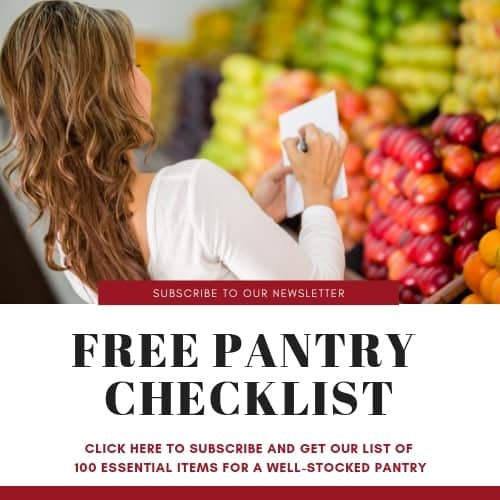 Don’t forget to check out the other awesome chocolate recipes this week and enter to win the chocolate prize giveaway! Enjoy! 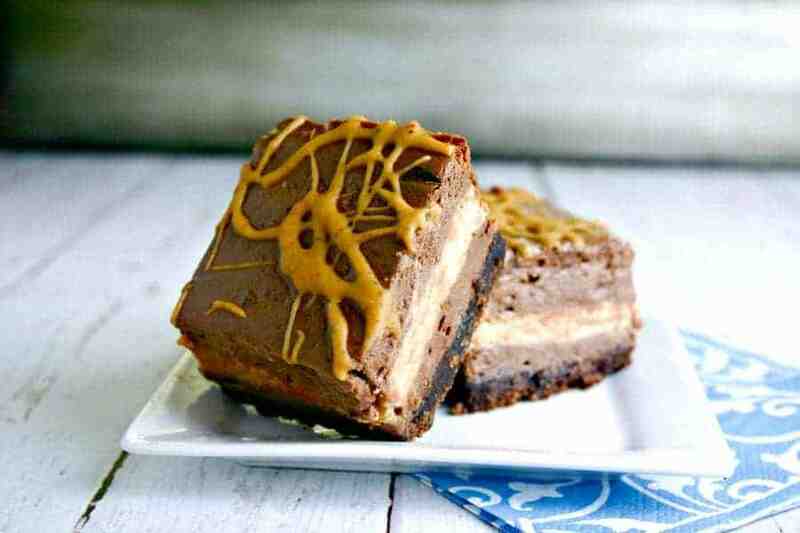 Chocolate Peanut Butter Cheesecake Squares - creamy hand-held chocolate cheesecake with a layer of peanut butter on top of a chocolate crumb crust. Preheat oven to 350 degrees. Line a 9-inch square baking pan with aluminum foil, extending over edges of pan. Coat lightly with cooking spray. 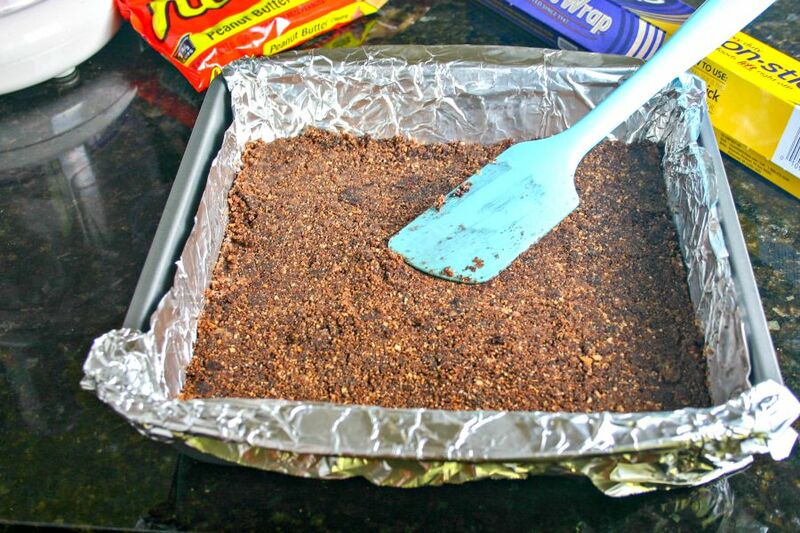 Combine all ingredients for the crumb crust and pour into prepared pan. Press firmly and evenly into bottom of pan. Bake for 8 minutes, then cool. Set aside. Place softened cream cheese and into the bowl of a stand mixer and beat until smooth. Add eggs one at a time, beating well after each. Gradually add sour cream, flour, and vanilla and mix until well combined. Take 1-1/3 cups of the cheesecake batter and mix with the melted peanut butter chips. Stir the melted chocolate chips into the remaining batter. 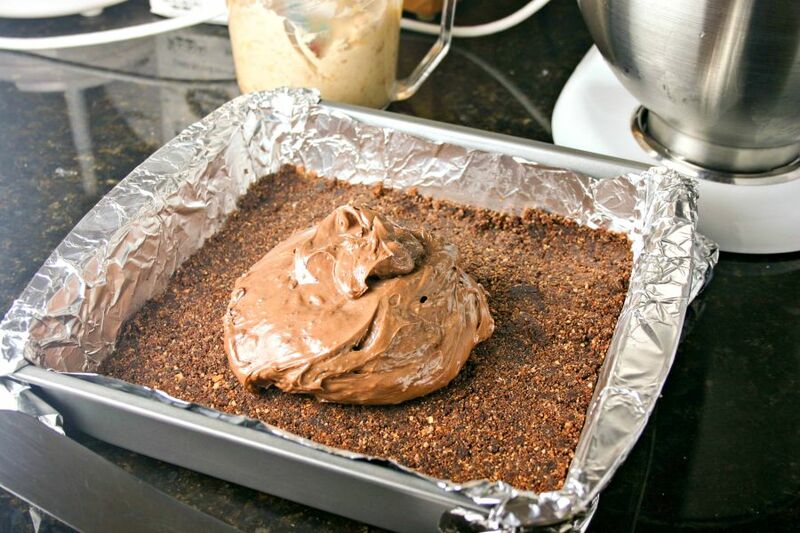 Pour half of the chocolate cheesecake batter on top of the crust and smooth out. 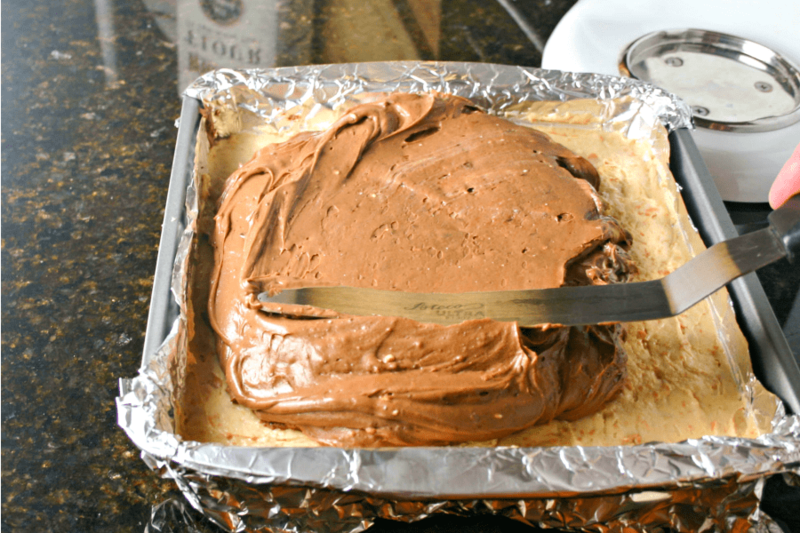 Spoon the peanut butter cheesecake batter on top of the chocolate cheesecake layer and gently smooth to edges of pan. Top with the remaining chocolate cheesecake batter and smooth the top. Bake for 40 to 45 minutes or until almost set. Cool completely on wire rack. Melt 1-2 tablespoons peanut butter chips with 1 teaspoon shortening. Stir until smooth and drizzle over cooled cheesecake. Refrigerate until drizzle is firm, about 3 hours. Using foil, life cheesecake out of pan and cut into squares. Thank you, Wendy! I’m always up for a chocolate-peanut butter dessert! 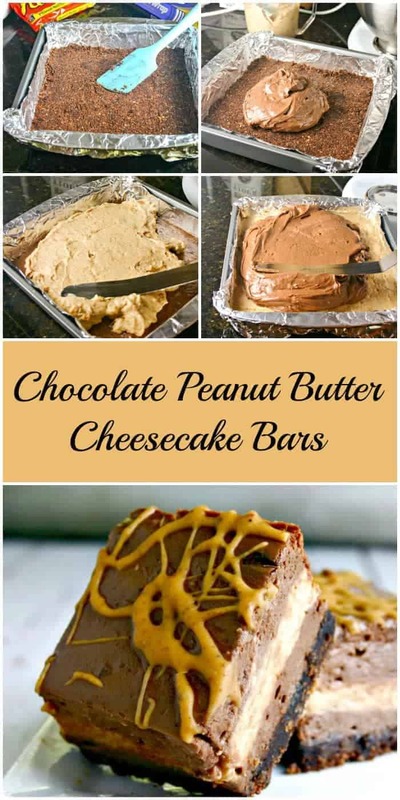 Chocolate, peanut butter and cheesecake….what more could a person want in life. I can’t wait to give these a try! They look so yummy! Looks delicious. I’m curious about why you bake the foil and cooking spray before you add the crust ingredients in…what’s the reason behind this? Hi, Megan! 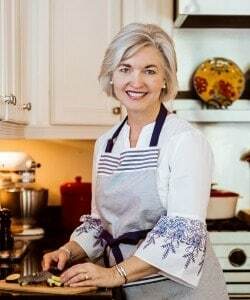 You found an error in my recipe, which I’ve corrected now. The crust bakes for 8 minutes. Thanks for letting me know!